July 16th, 2008: Sunny and Warm, Water Temp 85* and Clear. We got out at 5:30 and I set up where I thought we could catch some breaking Stripers. I showed the guys what to do in the event the fish would come up and within the minute they started breaking. 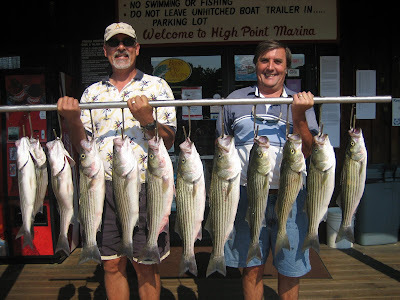 The Stripers surfaced for about an half an hour, fish blowing up all around the boat. We caught our share and I decided to start trolling . Lost that school and got on my big motor and found a school nearby. Made 5 or 6 passes on it, only catching 1 keeper fish so I left them and moved on. A friend called me into a school he had found and we worked it for 45 minutes till we limited out. We had a great morning today, worked 4 schools of fish, caught 18 Stripers and was off the water by 9:30 before it got too hot.